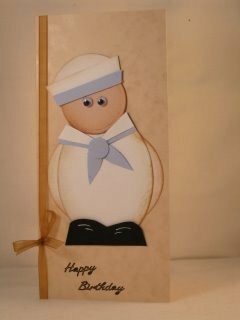 A novelty Sailor Card as a fun Birthday greeting. It's surprising what you can do with some left over papers and a few punches, and this Sailor card is no exception. All you need are some odd bits of white, blue and black card to make him. The shapes you will need are a large white oval for the body. A medium sized white circle cut in half for the arms, and a small circle cut in half for the hat. A pink circle for the head and some Googly eyes. 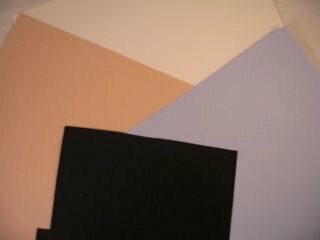 An oblong of black for the shoes, and some triangles in white and blue. Plus some extra bits of blue for the tails to his neckscarf. Ink the edges to add some shape to the body and arms. Place the half circles behind the body so that they just stick out at the each side a little. Stick this down to the front of your base card. With the black oblong I have curved the top to look like two shoes. Place the pink circle to the top of the body and fix in the googly eyes. 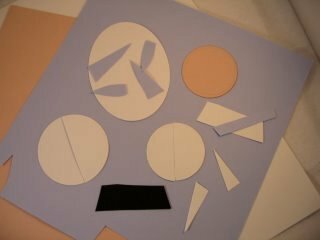 Attach the white triangle to the blue one and add to the body, just below the head. Fix in place two small shapes for the ties to the neck scarf and add a small blue dot for a knot. The hat is made by adding an oblong to the half circle of white card and then adding a smaller strip of the blue to represent a cap band. Cut these so the they curve outwards, as shown in the picture. Add some curves to the tops of the shoes with a white gel pen. And the finish the rest off adding any of your Embellishments. Add a little shading under the feet to ground the Sailor.